Home News What sort of democracy is this? What sort of democracy is this? A MEMBER of Parliament has told a constituent that ‘we remain a Parliamentary democracy and direct democracy must be secondary to that. Referendums do not work where you have a genuine Parliamentary democracy’. The MP is David Drew, Labour member for Stroud, whose email is contradicted by his public support for a ‘people’s vote’ on any ‘deal’ with the EU, while he opposes Theresa May’s proposed Withdrawal Agreement and ‘crashing out with no deal at all costs’. You can see the contradiction! Drew supports a referendum on any ‘deal’ while telling a constituent that ‘referendums do not work’. Drew characterises referenda as ‘direct democracy’, which means that all voters get to choose policy. Direct democracy is rare in the British tradition compared with Switzerland, where referenda are routine. Britain has held only three referenda in nearly 45 years: in 1975 voters elected to join the European Communities; in 2011 voters rejected preferential voting (ranking prospective MPs); and in 2016 voters chose to leave the European Union. Drew is wrong: Switzerland has both Parliamentary elections and frequent referenda. Drew’s other public statements don’t explain his position, but suggest that when he says that referenda don’t work for parliamentary democracies in general, he means that the referendum of 2016 doesn’t work for him personally. He (like most MPs) prefers to decide for himself the best way to interpret the referendum (as partial Remain) rather than to implement what the referendum actually chose (‘leave the EU’). He’s being egotistical instead of responsible. Let me explain our ‘parliamentary democracy’ to leave no doubt that Drew cannot claim that it excludes referenda. A ‘parliamentary democracy’ allows the largest party in Parliament to form the political administration (inaccurately known in British discourse as the ‘government’, which actually includes the nominally apolitical ‘civil servants’). This system is known as ‘Parliamentary’ because it was in effect invented in the English Parliament. A Parliament is a type of legislature – meaning the institution that passes laws. The government is a type of executive – meaning the institution that executes policy and represents the nation internationally. 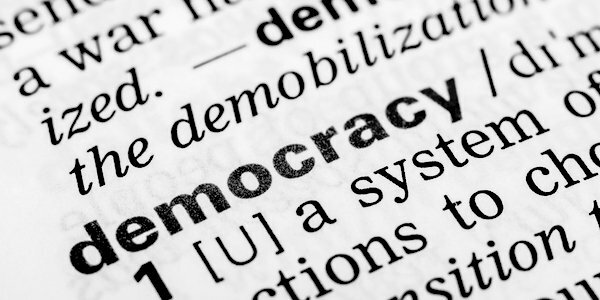 A parliamentary democracy contrasts most clearly with presidential democracies, where the president is both head of state and primary administrator (premier), and is elected directly and separately from the constituencies’ representatives. The British head of state is the monarch. The British premier (prime minister) is popularly elected to Parliament, then is appointed by the party as party leader, and would lead the government if the party were largest in the House of Commons. The party’s members in the House of Lords do not count in the House of Commons, although the prime minister can appoint Lords to the administration, and a Lord could resign a peerage in order to stand for the Commons. Lords are appointed by the monarch on the advice of government. Britain’s electoral system is rare in that each MP is elected given the most votes in that constituency (a first-past-the-post system), in contrast to proportional representation, where seats are distributed to each party in proportion to the votes won by the party nationally. In Parliament, each seat represents a constituency. Thus, the British system is a ‘representative democracy’, meaning that MPs represent their constituents, without accountability to them except at general elections (at least once every five years) or as recalled or de-selected. By-elections are normally called when the MP is incapacitated, so do not normally count as accountability. Rarely, a MP resigns then stands for the same seat to confirm legitimacy, as did Douglas Carswell when he switched from the Conservative Party to UKIP in 2014. Recalls or de-selections are becoming more frequent. Nick Boles (Conservative, Grantham) was de-selected in February, and Dominic Grieve (Conservative, Beaconsfield) was de-selected on 29 March, both for betraying promises to uphold the Brexit result. However, de-selections are incomplete expressions of mass dissatisfaction. The constituency party in effect expels the MP, but the MP can choose to carry on in Parliament as an independent or join another party: Dominic Grieve has vowed to carry on as if nothing has changed. Indeed, he said on live television that he was ‘wholly unconcerned’ about de-selection. Nick Boles actually resigned after his constituency party initiated de-selection, but before it could complete it, the parliamentary party declared that he was still a member. The only certain consequence of de-selection is that neither man will be allowed to stand for his constituency party at the next general election, short of forgiveness. The Speaker of the House of Commons could initiate a recall, nominally justified by criminal convictions or noncompliance with the House’s ethical standards. This recall would need to be confirmed by the signatures of at least ten per cent of constituents (not just party constituents), which would force a by-election. Peterborough is currently recalling Fiona Onasanya, who was convicted for speeding and perverting the course of justice. Meanwhile, she is free to vote in Parliament. Don’t treat the above description as fixed. The clash between the sort of egotism shown by Drew, the betrayals shown by Grieve and Boles, and the refusal of the Remainer-majority in Parliament to conform to the Brexit-Majority in the electorate is changing the constitution. Theresa May’s administration has already changed the norm that motions can’t be re-presented without changes: her Withdrawal Agreement has been rejected three times in as many months, yet she still plans another motion, despite no changes, other than to addend or detach parts. The Speaker (John Bercow) is supposed to be the ultimate protector of the constitution in the Commons, but in January he allowed Grieve to amend a government motion, contrary to precedent that only government can motion. Bercow let his Remainer sympathies trump his responsibilities. Just two weeks ago, MPs voted the precedent of choosing for themselves what policy should be. The second round of this process occurred yesterday (appropriately, April Fools’ Day). Bercow is complicit in this too: he allowed a third vote on May’s proposal last week after MPs had motioned alternatives that look more like Remain; this week he is allowing more rounds of voting on those alternatives, even though none was approved last week. Clearly, the British system has failed at Brexit. Parliamentarians are not upholding: their promises to uphold the referendum of 2016; their party manifestos of 2017 to leave the EU and to exclude the options now being offered as alternatives (such as customs union); their repeated policy statements (such as: we’ll be leaving the EU on 29 March), or even the constitution. Clearly, British Parliamentary democracy needs more referenda to reconnect politicians with popular will. I’d suggest a law forbidding any surrenders of sovereignty without referenda. I’d suggest automatic exclusion of MPs for any criminal conviction, without need for a recall (currently, the sentence must be for longer than 12 months). I’d suggest legislation to force a by-election as soon as a MP is de-selected; and to allow constituents to initiate recalls for themselves (as in the US). I’d suggest a constitutional text, rather than relying on precedents; and a constitutional court, rather than letting the Speaker decide without accountability. In the immediate term, we lack my suggested improvements above, which is why I have already recommended civil disobedience as a legitimate and proportionate response to Parliament’s failure to represent popular will, party manifestos, and policy commitments.